It’s been more than 30 years since Peter, Raymond, Egon, and Winston first hit New York’s streets in search of stray ghouls. Now, a new crew of exterminators are on the paranormal hunt—and they look a little better in a onesie than Bill Murray or Dan Aykroyd. Our first look at Sony’s Ghosbusters reboot is finally here, starring Kristen Wiig as physicist Erin Gilbert, Melissa McCarthy as paranormal researcher Abby Yates, and Kate McKinnon as nuclear engineer Jillian Holtzmann. The group catches a glimpse of their first real-life ghost in a scene set in the New York Public Library, an homage to the 1984 original. As the dream team prepares to fight a surge of paranormal activity that plagues the city, subway worker Patty Tolan (Leslie Jones) joins the club and offers up her uncle’s ’80s Cadillac hearse as the group’s revamped ride. If the trailer is any indication, one thing is for sure—there will be plenty of slime. Kristen Wiig gets a good dousing, and the original Slimer even makes a cameo appearance. Murray, Aykroyd, and Ernie Hudson are also expected to appear, though they’re not in the trailer. We did, however, catch a quick glimpse of Chris Hemsworth, who plays a nerdy-but-under-my-glasses-I’m-really-hot secretary. 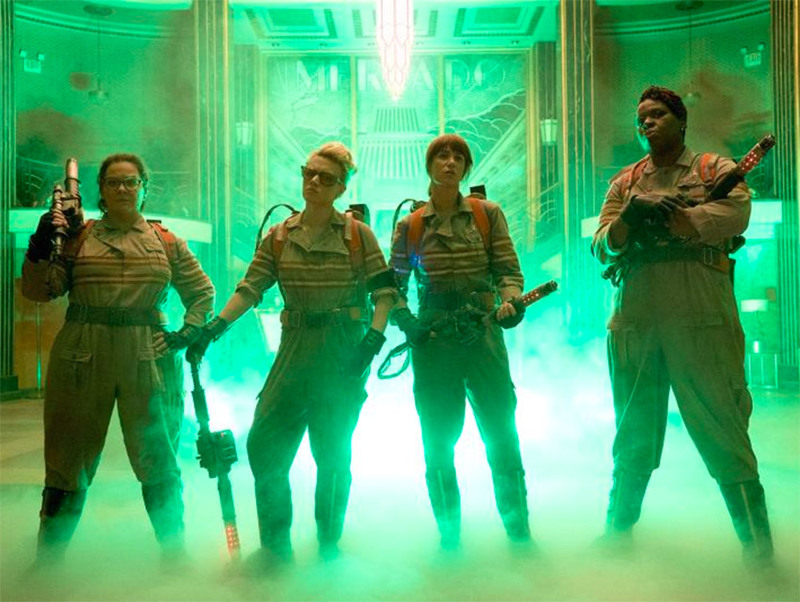 Ghostbusters hits theatres on July 15.